Warner hat jetzt auch offiziell in Deutschland die zweite Staffel von "Game of Thrones" für den 5. April auf Blu-ray Disc und DVD angekündigt. Zu den Extras gehören das umfassende „Making of“ der vorletzten Episode „Blackwater“, eine umfangreiche Analyse des Kriegs der fünf Könige und sorgfältig zusammengestellte Chroniken und Figurenprofile. Umfassende Infos zu den Extras liegen bislang nur in Englisch vor. 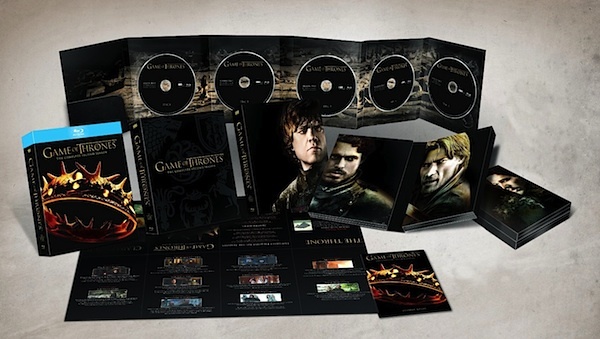 Exklusiv bei amazon gibt es auch eine "Game of Thrones - Season 2" Blu-ray Disc-Sonderedition mit Sammler-Pin. Audio Commentaries: 12 commentaries with cast and crew including David Benioff, D.B. Weiss, George R.R. Martin, Emilia Clarke, Peter Dinklage, Kit Harington and more. Creating the Battle of Blackwater Bay: See how the epic Battle of Blackwater Bay was brought to life in this exclusive, in-depth, behind-the-scenes look at the climatic episode. The 30-minute feature showcases never-before-seen interviews with cast and crew. Game of Thrones: Inner Circle: Actors Emilia Clarke, Kit Harington, Lena Headey, Michelle Fairley and Liam Cunningham talk in detail about their experiences shooting season two in this roundtable discussion moderated by executive producers David Benioff and D.B. Weiss. The Religions of Westeros: Hear author George R.R. Martin, David Benioff and D.B. Weiss discuss the competing religions in the series and how they influence the various characters in Westeros and beyond. Character Profiles: Profiles of seven major characters as described by the actors portraying them including Renly Baratheon, Stannis Baratheon, Robb Stark, Theon Greyjoy and more. War of the Five Kings: Track the claims, strategies and key players involved in the battle for the Iron Throne with this interactive guide that follows the movements of various armies detailing their victories and defeats. Histories & Lore: 19 animated histories detailing the mythology of Westeros and Essos as told from the varying perspectives of the characters themselves and featuring, in part, illustrations from "Game of Thrones" storyboard artist Will Simpson. In-Episode Guide: In-feature resource that provides background information about on-screen characters, locations and relevant histories. Hidden Dragon Eggs: Find the hidden dragon eggs to uncover even more never-before-seen content.